Champagne makes a wonderful wine as an aperitif. It encourages conversation, gives a touch of style to an evening with friends and sharpens the appetite . When coming from a good producer (and not too heavily dosed) champagne is also the wine that is easiest to match with food. The range of matches is very wide. The most obvious marriages are those with fish (however cooked), shellfish, poultry, white meats and cheeses. Matching them with red meat can be trickier, but pink champagnes when vinous can make some very fine marriages. It is only sweet dishes which can harm champagne, unless of course it is a champagne called “demi-sec” in other words with a dosage from 32 to 50g/litre of residual sugars. It is therefore a bad idea to drink champagne with your dessert. Sweet & sour dishes should equally be matched with care. Francis Boulard & Fille champagnes are champagne wines that are full of character and body. All the wines can be served at table without the faintest hesitation. Brut Nature (zero dosage) are particularly successful when matched with fish, whether grilled or pan fried, cooked simply or “en papillote” (sealed in a packet). They also go wonderfully well with shellfish, especially oysters. 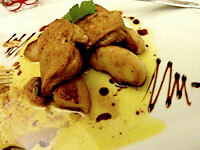 Turning to fishes in a sauce and white meats, the Extra-Brut and Brut Nature both go very well. 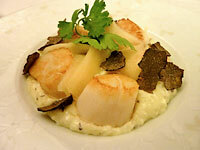 If the dish has a hint of sweetness, then it would be better to choose the Extra-Brut. The older champagnes, such as Petraea and Les Rachais give superb matches with poultry and white meats. The match of these two wines is equally very successful with foie gras. Fleurs de courgette en cristalline, Dos de cabillaud à la vapeur de champagne... accompagné d'un Les Rachais 2008 chardonnay (= Crystalline zucchini flowers, Cod fillet steamed in champagne ... accompanied by Chardonnay Les Rachais 2008). How do you keep champagne? Contrary to common belief, champagne as a complete wine, keeps very well and even gains complexity with age. At least, this is true for good champagnes... Keep the bottles lying down, preferably in a cool cellar, and away from the light. In an apartment, prefer to use the lower part of rarely used cupboards, or the back of a store room. To keep a bottle once opened, use a special champagne sealer. This will allow you to keep the champagne for a day, even longer. If the bottle is less than a third full, it is sensible not to wait too long to finish it. Putting a small spoon in the mouth of the bottle is of course completely useless!